SEAT has unwrapped the Ibiza Cupra Concept, which previews the new hot version of the recently updated Ibiza in near production ready form. It’s still powered by a twincharged 1.4-litre engine with paddle-shift DSG gearbox but there are some improvements over the outgoing Ibiza Cupra. The new model is due to go on sale in late 2012. The most noticeable changes are cosmetic, with a new grille, new headlights, LED running lights, and LED tail lights. 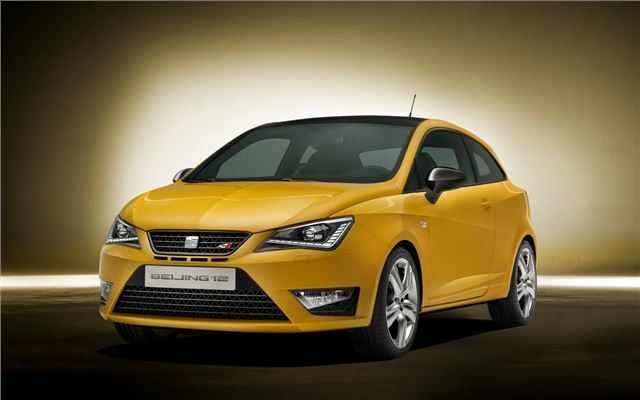 The gloss black wing mirrors – a traditional Cupra feature – contrast against the yellow paintwork on the concept model, which is being displayed at the Beijing 2012 Motor Show. A matt black rear diffuser and trapezoidal exhaust completes the bold exterior look. The interior is trimmed in black leather with yellow stitching, and an all-new entertainment system is fitted. It includes a removable SEAT Portable System like that seen in the recently launched Mii, which features sat nav and can be integrated with the vehicle’s systems. It offers various functions, including hands free for mobile phones. Eventually it’ll be offered as an option across the Ibiza range. You can expect to see more information in the production version of the new Ibiza Cupra before it goes on sale later this year.